Sydney, Aust., September 20, 2011 — SanDisk Corporation (NASDAQ: SNDK), a global leader in flash memory storage solutions, today unveiled a broad lineup of new retail products and introduced a new preservation solutions category. SanDisk’s product portfolio addresses all market segments—from mobile phones and cameras to notebooks and tablets—and use cases ranging from entry level to professional. “Our flash storage solutions help consumers capture more photos, load their mobile apps faster, share exciting moments with friends and preserve their memories for generations to come,” said Edwin Cheng, Product Marketing Manager, Asia Pacific, SanDisk. SanDisk® Memory Vault: SanDisk introduced a new product that is tested to preserve images in their original quality for up to 100 years1. The SanDisk Memory Vault provides consumers with a convenient, reliable way to pass down their images for generations to come—a photo album for the digital age. SanDisk released the results from an online survey conducted on its behalf by Harris Interactive from July 28-August 1, 2011 among 2,294 U.S. adults aged 18 and older. The survey found that 79 percent of U.S. adults who have digital photos plan on passing them down to future generations. Photos are so precious that 64 percent of U.S. adults would not consider destroying their family photo collection for any amount of money, not even for one million dollars. Valuable photos deserve reliable storage solutions. SanDisk developed the SanDisk Memory Vault using Chronolock™ technology, which incorporates the key elements of advanced solid-state storage to create a proprietary memory management solution. This allows the device to provide consumers with peace of mind that their precious photos and videos will be preserved for up to 100 years. 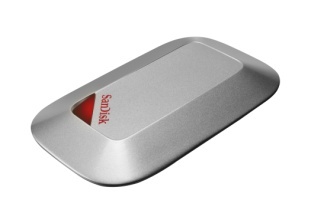 The SanDisk Memory Vault comes in 8 gigabyte3 (GB) and 16GB capacities carrying MSRPs of $79.00 and $99.00. 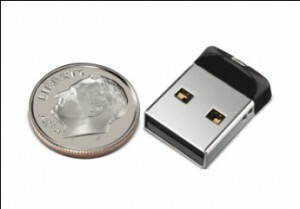 To learn more about the online survey and the SanDisk Memory Vault, click www.sandisk.com. 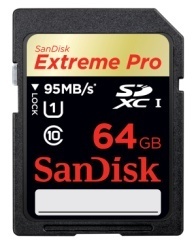 64GB SanDisk Extreme® Pro™ SDXC™ UHS-I Card: SanDisk doubled the performance and capacity of its professional-grade imaging lineup to create a new SD card based on the latest SD 3.0 specification’s Ultra High Speed (UHS) bus architecture. The card offers the fastest write performance of any SD card in the world to date and is ideal for imaging enthusiasts using UHS-enabled cameras. The card’s up to 90 megabyte per second (MB/sec)4 write speeds let photographers capture a series of RAW images using burst mode, and its UHS Speed Class 1 rating can record Full HD videos5. The card features up to 95MB/sec read speeds capable of supporting transfer of photos to a computer in half the time. SanDisk Extreme Pro SDHC™ and SDXC™ UHS-I cards come in 8GB to 64GB capacities with MSRPs starting at $49.00 (8GB)~$399(64GB). Mobile_Ultra_microSDXC_UHS-I_NoClass_Angle_64GB_HR64GB SanDisk® Mobile Ultra™ microSDXC™ Card: SanDisk’s new 64GB microSDXC card can double the capacity of even the most advanced smartphones and tablets. The UHS-based, high-capacity card features up to 30MB/sec4 transfer speeds and offers the Class 6 performance needed to capture Full HD videos. The card is compatible with any tablet or smartphone equipped with a microSDXC card slot. Mobile phone sales are expected to reach 1.7 billion in 2014, and the majority of these handsets will include microSDXC card slots, according to Strategy Analytics, Slotted Phone Shipments Forecast, 12/10. Mobile phones allow consumers to create and enjoy an increasing amount of digital content, ranging from user-generated Full HD videos to full-length feature films and videogames. High-capacity mobile memory cards provide the storage expansion consumers need to keep up with the explosion of digital content. SanDisk Mobile Ultra cards come in capacities ranging from 4GB to 64GB to meet a variety of needs, with MSRPs starting at $12.99(4GB)~$212.99(64GB). Cruzer® Fit™ and Cruzer® Switch™ USB Flash Drives: SanDisk’s new Cruzer Fit USB flash drive is about the size of a dime, fitting easily into USB-compatible tablets and notebooks for convenient storage expansion. The drive comes in 4GB to 16GB capacities with MSRPs starting at $9.99(4GB)~$28.99(16GB). SanDisk’s new Cruzer Switch USB flash drive features a cap-less, slider-less, flip-top design for easy portability and comes in 2GB to 32GB capacities with MSRPs starting at $7.99(2B)~$50.99(32GB). 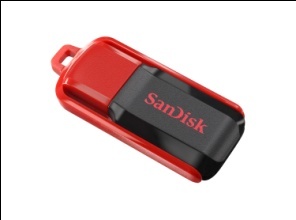 SanDisk® SecureAccess™ Software: SanDisk offers encryption and online backup features (up to 2GB optionally available*) on almost all of its retail USB drives. The software creates a password-protected** private vault on the drive that lets consumers share the files they want while protecting sensitive data. ImageMate® All-in-One USB 3.0 Reader/Writer: Based on USB 3.0 interface transfer performance of up to 500MB/s***, this card reader/writer reduces transfer time when downloading data from a card to a computer. Outfitted with four card slots, this compact solution supports all major card formats and is backwards compatible with USB 2.0-enabled devices. Its sleek vertical design and small footprint makes this a great choice for stylish and fast photo and video transfer. The reader/writer carries an MSRP of 49. The Cruzer® Fit™ and Cruzer® Switch™ USB Flash Drives are available now. The other products will be available in the fourth quarter of this year.